I'm thinking about ways to make a self-contained gun where the energy to fire it is delivered manually by pulling a more-or-less constant force across a moderate distance (3 feet). Supposing I can lift about 50lb, and suppose I can make the 'stacking curve' sufficiently flat that I deliver 80% of the nominal F*d work to the mechanism. Then suppose the delivery to the projectile is also about 80% efficient. That yields 100 ft*lb = 136 J muzzle energy. For a 20g bolt, that's 114 m/s = 375 fps, which is typical for a bow. But what I want to do is transfer the energy to a much lighter projectile, say a 1g lead pellet (.22 cal). No bow can handle this -- it would be essentially a dry-fire, which would destroy the bow. But supposing I could do it somehow, the pellet would be traveling 510 m/s, which is supersonic! That also would not play well with bowstrings. So, naturally, my thought is to make a spring-gun / light-gas-gun, where the energy is accumulated in a heavier intermediate projectile, which then goes into adiabatically compressing a small volume of air to drive the pellet. The down-side to this concept, compared to the usual spring gun, is the need to minimize the friction on the piston due to the long travel distance. Also, the device will be much bulkier, with the crossbow arms sticking out, etc. My next thought was, what about using a piston backed by a large reservoir at high pressure as the energy storage mechanism? You could easily get a very-constant 60lb draw weight with 75psi acting on 1" piston. If you have a 4ft x 2" diam chamber, then the working volume changes less than 20% during the cycle, achieving the flat stacking curve I wanted. Now your piston could do double-duty, in the same tube. The remaining issue is how to draw the piston back. If you want a 3ft travel using a draw rod, that means the top of the rod is at 6ft above the ground when drawn, which is clumsy -- I'm imagining the draw action starting from ~ 1ft and going to 4ft off the ground. It's hard to imagine any other way to access the piston mechanically, though. I suppose the alternative is to use a higher-force piston with a short travel, and then get the draw you want by some type of external mechanical advantage system, such as pulleys or levers. This sort of defeats the point of having a super-simple mechanical system, but it could also allow you to compensate for a non-flat stacking curve from the piston. You wind up with something that converges to a gas-spring-based spring gun. Just for reference, some .22 air-spring pellet rifles claim 50lbs cocking force and 1000fps = 300 m/s, which is probably lower than what I'm aiming at due to the shorter effective draw produced by the break-action style. One potentially nice thing about using external mechanisms: you could include a ratchet mechanism, which would allow you to split the loading effort into a few strokes of the handle, while retaining the nice property of essentially flat stacking on each stroke, unlike pumping up a regular pneumatic. This could also let me get above 500 m/s, into serious velocity territory. OTOH, if we're going to get into mechanical advantage, it would potentially be simpler to go back to the crossbow-style device. I still think this might be a fun build -- maybe go for a shorter travel, with a much higher draw weight. The piston tube would be slotted (except for the front few inches) to allow the bowstring to attach to the rear of the piston. I think you could build a relatively low-tech gun with very high muzzle velocity this way. And it would look like Chewbacca's crossbow rifle, which is a plus in my book! I think I'll call it "The Peashooter" if I build it. Let's run some numbers: say I want to keep that 100 ft*lb muzzle energy. I'd benchmarked 50lb*3ft*80% = 120 ft*lbs to compensate for losses. Now let's say I want to use a linear stacking curve, so 50% stacking efficiency, and cut the travel down to 6", which puts us at 480lb at peak draw. Yikes! That's too much force on the trigger mechanism, IMO. Increasing the travel to 12" brings us to 240lb, which is comparable to existing crossbow numbers. Using a 4:1 pulley would turn that into 4ft travel with manageable 60lb peak force. I found a crossbow for $80 on ebay with 14", 175lb draw, claiming 111 ft*lb for arrows. This is slightly less than what I was hoping for, but it shows that it's quite feasible, using a cheap commercial crossbow. Okay, so now I would construct a slotted piston tube, and some type of breach adapter connecting it to the barrel. This might be a break-action style, for simplicity and for minimizing the dead volume. A used Crossman .22 barrel is 18" and $20 on ebay. It would probably require a bit of machining to make a suitable piston & tube, and the breach interface. Then you also need to extend the stock on the crossbow to support the barrel. Supposing I could scrounge some scrap parts & do the machining myself, I could probably build this for $100 total. This is not great considering you can buy a 1400fps .177 air rifle for $150-ish, or 1100fps at .22 for the same price (however, the muzzle energy is only 29 ft*lb, so they are using a lighter round than I am benchmarking, too). So I guess my point is, I could get 3x the muzzle energy for roughly the same price, and it would also have a big novelty factor. And in fact, it might be possible to do even better on the muzzle energy at reduced price, with a DIY bow. Plus, you have the novelty factor. 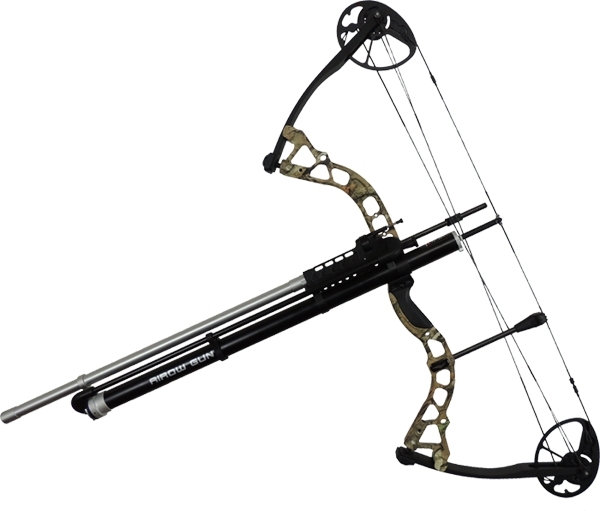 Going down in energy, there are some pretty cheap ($10) 50lb, 6" draw toy crossbows. With 12.5 ft*lb at 80% conversion, you could accelerate a 0.1 gram projectile (airsoft BB) to ~450m/s -- so this would be a true supersonic peashooter. I had toyed with the idea of an elastic powered launcher. so you might need to give the piston 300 footpounds to get 100 at the muzzle. From a non-compounding bow that means something like a 600 pound draw on a 12" stroke, ignoring losses on this part of the mechanism. I think it's possible but quite a challenge... unless I misunderstand. As a thought experiment it is fascinating! We could use hydrogen for the working fluid, that would help efficiency... maybe an ultra light piston from carbon fiber... the bow or primary spring doesn't need to be fast so that can be sort of conventional. The Airrow Gun comes to mind, it claims "an impressive 475 fps (*using a 50 lb bow at 29 inch draw)" with 0.22" pellets of an unspecified weight. Not really impressive figures compared to a spring piston rifle, and looking at the setup you can see why - the air has to turn 180 degrees twice before getting to the barrel, with a lot of dead volume. If you want supersonic velocities, it seems to me that high pressures are essential and this would be difficult to achieve. @Jack: I stumbled across the Airrow as well. That's a good picture of it -- no wonder the muzzle velocity is abysmal! Btw, I also saw that you made a pneumatic crossbow long, long ago! I spent the weekend learning about springer internal ballistics. Evidently 35% efficiency is about as good as it gets, and the efficiency really drops off with higher Mach number, unsurprisingly. I think this has more to do with the air behind the piston than ahead of it, though. Evacuating the barrel might help, but I'm guessing it wouldn't be that substantial. In a 24" long, 0.25" diameter barrel, the mass of air in the barrel is only 0.35 grains (at sea level), where the pellet mass is something like 20 grains for that caliber. So even if the pellet goes supersonic and "snowplows" all the air in front of it, the energy lost is minimal. The pressure generated in stopping the piston is immense! The piston in Cardew's example rebounds on an air cushion about 0.1" thick (ie, compression of 30x), and around 1250psi. The temperature gets up to 800 C or higher. This is for a gun with 80 ft*lb stored energy. If there's any appreciable friction, the terminal velocity of the pellet inside the barrel is going to be substantially less than the sound speed of the air in the barrel behind it. The trick to getting extreme muzzle velocities (ie, Mach number >1) is probably in over-sizing the volume of air in the piston compared to the barrel, such that the air is still quite hot when it has expanded enough to push the pellet out the muzzle. However, this means that the air hasn't expanded back to atmospheric temperature/pressure, so it still contains a fair amount of energy. It's definitely possible to get 1400fps (ie, Mach >1) with a spring gun, and it's something that a PCP probably can't do. However, it looks like only 0.177" versions get that kind of speed, probably b/c the necessary stored energy for putting a 20 grain 0.22" pellet to that speed (435 ft*lb @ 20% efficiency) would be too much to deliver in a single stroke. Long story short, it looks like my idea was way too optimistic in terms of efficiency, especially at high muzzle velocity. Skywalker wrote: I also saw that you made a pneumatic crossbow long, long ago! Ah yes, back in the days when balsa wood was an acceptable building material. A long, long time ago indeed!